How old do you have to be to get a Driving Permit? How much does it cost for a Driving Permit at the DOL? - $25.00 Your Driving Permit is good for one year. What do I bring to the DOL (Department of Licensing) to get a Driving Permit? - If you have any questions for the DOL, please feel free to contact them at 360.260.6122. What is the Minimum Age to apply for your Driving Privileges? 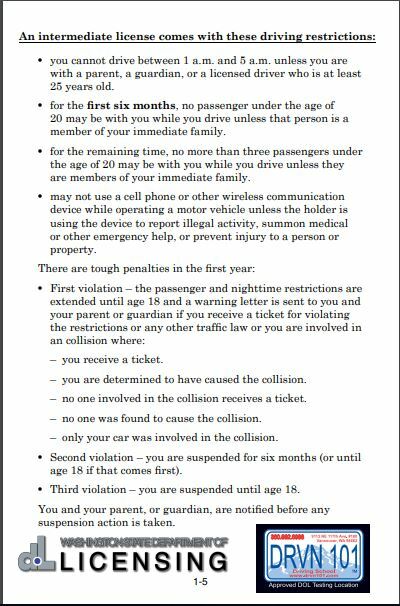 Note - Have your permit prior to scheduling any Driver's Ed Drives. Schedule five one-hour drives, and one observation. Try to schedule one every 7-10 days. Don't schedule drives at the same time as your scheduled class time. Why choose the best driving school? Driving a car is the most dangerous thing you will do every day for the rest of your life. Most of us only take Driver's Ed one time and then use that skill every day for the rest of your life. Taking the best class you can find will help reduce your risk through education. Why choose Driving 101's Exclusive Driver's Ed Program? 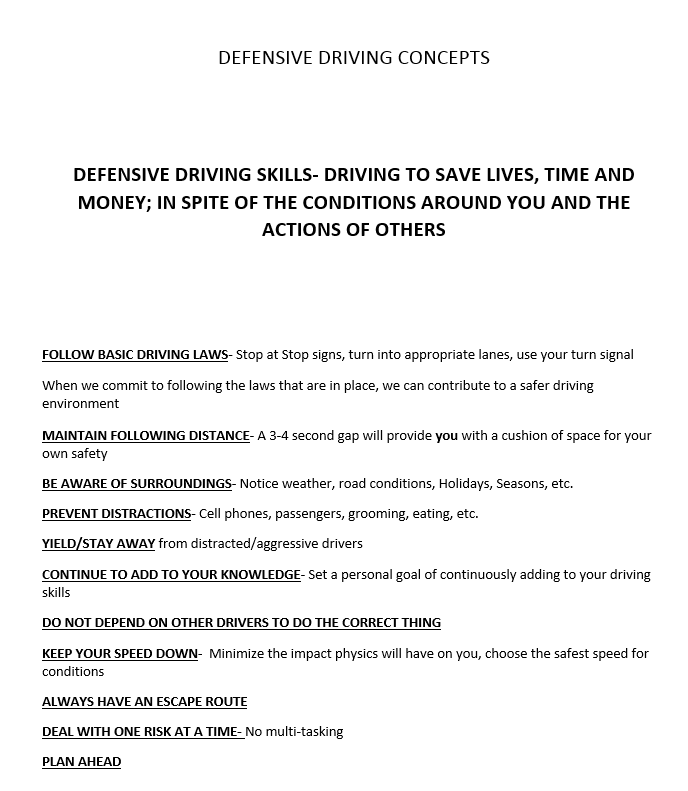 * Our entire program is Defensive Driving based; when our students are done their certificate says Defensive Driving, Traffic Safety Education Course. Some insurance companies give an additional discount for the Defensive Driving piece, but regardless of the discount, it helps your new driver know what all the hazards are that they should be looking for. * Two hour action packed Drug and Alcohol Awareness Training Class through the Clark County Sheriff's Department; Completion Certificate is signed by the Deputy. * The day before each of your child's scheduled drives we do a courtesy call reminder. We know our students are going to use the skills from our class every day for the rest of their lives and we have a strong passion to help make them the best drivers we can. Our goal is to create life-long safe drivers. We really appreciate you taking the time to read this. If you have any questions please don't hesitate to contact us by email or call 360.892.6988 or come on in. You are also welcome to sit through a class or drive to get a better idea of our program if you would like. Do I have to take a course at a driving school? - Yes, if you want to obtain your license before you are 18, you are required to take a Driver's Ed class. - No, you don't have to take driving school if you want to apply for your license after your 18th birthday. How long does driver's ed take? - Our Driver's Ed class has 17 two-hour classes and WA State Law says the class must be a minimum of 30 days. - Monday - Thursday class will take 30 days. - Tuesday and Thursday class takes an average of eight weeks. - Monday and Wednesday class takes an average of eight weeks. - Monday, Wednesday & Friday class takes an average of six weeks. Driving 101 is a Defensive Driving Driver's Ed program that costs $425. - You get to do an accident prevention drive which goes over all the "what if's," how to prevent an accident http://www.youtube.com/watch?feature=player_embedded&v=SsS5jR4qSDk . - You will also get to come to a two hour Drug Awareness Class through the Clark County Sheriff's Department. This class will go over all the drugs new and old and what they do to you, how it effects someone and why you don't want to ride in a car with people under the influence of anything from Tide soap to heroin. This action packed seminar style class will keep you interested and learning as much as you can. Why chose an accredited defensive driving school like Driving 101? We teach our students skills that will benefit them for the rest of their lives and keep them safe on the roads. Our award winning curriculum will train them to drive defensively and very possibly save you money in the long run, as many insurance companies offer significant discounts for drivers that hold a certificate of completion from an accredited defensive driving program. Do I have to hold my permit for six months? - Under 18 years old, you must hold your Driving Permit for a minimum of six months. - Over 18 years old, you do not have to hold your Driving Permit for any amount of time. Where do I go to take my DOL Written and Drive Exam in Clark County? - If you want to take your Driving License test call our office at 360-892-6988 to schedule your appointment. - Your test will take place at 9113 NE 117th Ave #100 Vancouver, WA. How much does it cost to take my Driving License Exams? - $39 for the Written Exam, No Appointment necessary. - $40 for the Drive Exam, once you pass your Written Exam you can schedule your Drive Exam. - $20 if you prefer to use our Driving School car. Do I have to schedule an appointment for my Driving Exams? - You only need an appointment at Driving 101 to take the Drive Exam; the Written Exam is walk in based. What do I need to bring to my Drive Exam? - Come in 10 minutes early. What do I bring to the Department of Licensing (DOL) when I am applying for a Driver's License? - ID, Passport, or Certified Birth Certificate & Social Security number. - All your Driving Test Scores will be electronically sent to the DOL. How much will it cost me at the DOL for my first Washington State Driver's License? How many hours do I need to practice? - You will need to practice a minimum of 50 hours from when you apply for your Driving Permit to when you apply for your Driver's License. What kind of driving techniques should I practice? - You can review all Driving 101 "How To" videos. - Did you know you can get your license online, you just have to have a Washington state photo ID or Permit. Driving 101 is one of Clark county's only defensive driving school.